Just think what life was like in rural America before and after the mail-order catalog. Aaron Montgomery Ward used the trains in Chicago to get goods to far-flung parts of the country. Mr. Ward and his partners stocked goods to launch their first mail-order catalog, but his stock was destroyed in the Great Chicago Fire of 1871. He did not give up but started over, an inspiration to us all, and the Montgomery Ward Catalog debuted the following year. It was a single page long, basically a price list with ordering info. 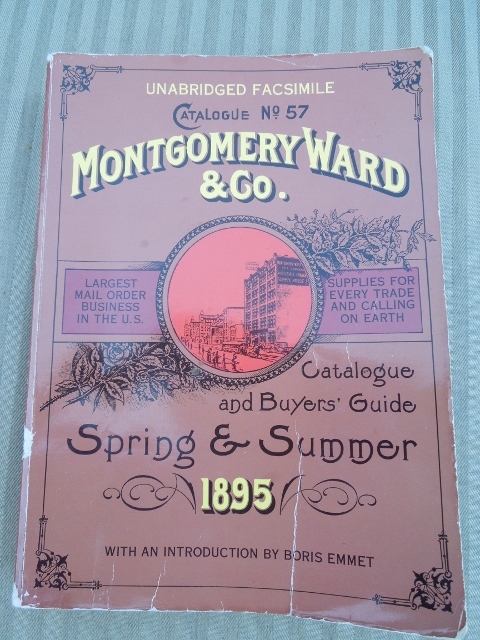 I own a replica of an 1895 Montgomery Ward Catalogue, published by Dover. I am writing a novel set in the West in 1894, so an 1895 catalog is fantastic for me, but some of the items are remarkable. For example, it offers music boxes, the kind we had as children for our jewelry, but these played three songs, or six or eight, depending on how much you wanted to pay … it was the days before radio. I bought it brand new several years ago. Wearing it out. We’re all familiar with old butter churns where the person pushed a pole up and down. In 1895, people ordered butter churns that were boxes or barrels with a side crank. Everything’s up to date in Kansas City! If you could spend another fifteen or twenty-three dollars, you could buy a treadmill to attach to the churn’s crank and put your sheep, goat or one or two dogs walking on it, and they’d churn the butter. The latest styles: those little hats women wore, with lots of bows on them. Corsets. Stereoscopes — here’s a link to my post on those . At over 600 pages, it offers thousands of items. It had no competition at the time, years before Sears & Roebuck. Aaron Montgomery Ward used his fortune to sue the city of Chicago twice to remove and prevent structures in Grant Park, shown below, a lovely park between the skyscrapers and the lake. Bully for you, Mr. Ward. In the western novel, Shane, set in the early 1890s in Wyoming, the mail order catalogue plays a part. In the 1953 movie based on the novel, the homesteaders marvel at a catalogue in the general store. I read today that some store owners burned the catalog. It was their competition. I’ll have to reread Shane. Similar setting to my novel. I did re-watch that Twilight Zone with the three astronauts you recommended. Still cool. Another favorite of mine is the 3 National Guard soldiers who go out on patrol in 1963 and run into Custer at the Little Big Horn–what makes it work, I think, is a great performance by the character actor, Warren Oates. Give it a try! I saw that TZ long ago. It’s lunchtime — I’ll see if I can find it to watch now. Watched that. The one with the three astronauts was based on a short story by Richard Matheson. As I recall, there was a guy named Charles Beaumont who wrote a lot of good ones. I just googled and he did indeed write quite a few, including another of my favorites, Printer’s Devil, with Burgess Meredith. I still have a jewelry box with a wind-up key that plays a single chimed tune while a tiny ballerina twirls on her toe points. It never occurred to me how old it must be. As a girl I was a tom-boy so didn’t like wearing jewelry but I’d select something just to hear the tune. I still spell it “catalogue,” as that was in use up until at least the 1970’s. These days “catalog” is more common, although the Brits still spell it the long way. We had a Montgomery Ward store in our town, and we got the Sears catalogue every year, and we were excited about both. And I’m very pleased that Mr. Ward was so protective of Grant Park. It’s still a beautiful place.